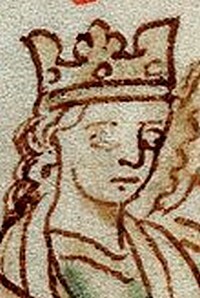 Born in 1223 at Aix-en-Provence, Eleanor was the second daughter of Ramon Berenguer V, Count of Provence and his wife, Beatrice of Savoy (1205–1267). The couple had three more daughters, Marguerite, Sanchia and Beatrice, all of which were destined to become Queens. Together with her sisters, Eleanor, who was renowned for her beauty, grew up at the Provençal court. Her father was a patron of troubadour literature and minstrels, tournaments, music, dancing, and the courtly love culture were all an integral part of her upbringing and life. 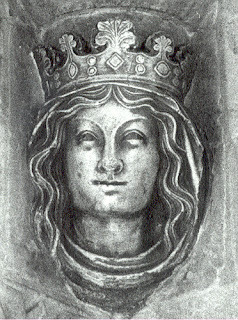 Like her namesake Eleanor of Aquitaine, Eleanor of Provence too was a child of the South. So imagine how lost she must have felt when, at the tender age of 12, she married the 28 year old English King Henry III. England at the time was quite a provincial country compared to her own cosmopolitan native land, but luckily for Eleanor, Henry tried to make the move easier for her. Fearing she would consider the royal palaces too shabby, he built or improved apartments for her in nine of them, created gardens for her at Claredon and Windsor, and appointed two of the courtiers she had had the most contact with before coming to England, John of Gatesden and Robert de Mucegros, as her wardrobe keeper and steward. This way, she would be welcomed by some familiar faces, which hopefully made her feel less lonely. Despite Henry’s efforts, adapting to her new life as a Queen and wife wasn’t easy for Eleanor and she relied heavily on her Savoyard relatives, who had followed her to England. Because of this, the English people never warmed up to Eleanor. The young girl became a wife, in every sense of the word, from the very beginning. Henry started sleeping with Eleanor straight away. This horrifies us today, but may very well have saved Henry’s life back then. One night, in fact, a madman managed to break into the King’s room, holding a knife in his hand and demanding the crown. But the room was empty as the King was sleeping with his wife and it was one of her ladies-in-waiting, Margaret Biset, who raised the alarm when she noticed the madman roaming around the palace in search of his royal victim. In 1239, Eleanor gave birth to her first child, Edward. His birth also marked the start of her political career, in which she was at first guided by her uncle, Peter of Savoy. Henry was preparing a military expedition to Poitou and, to straighten his infant son’s position against that of Richard of Cornwall (Henry’s younger brother), the King decreed that in the case of his death all his castles would go to Edward and thus end up under the control of the Queen and her relatives, while Richard was completely left out of his nephew’s regency. To sweeten the pill, the royal couple despatched Peter to negotiate a marriage between Richard and Eleanor’s sister Pancha, which would unite their interests. This however, didn’t go down well with the English people who feared the Queen had too much power and that from then on they would be ruled by Eleanor and Sancha. In the following years, Eleanor gave birth to four more children, Margaret, Beatrice, Edmund and Katherine. As the royal family grew, so did the complaints against Eleanor. When Henry started to allow English noblemen to marry Savoyard girls, the English magnates began to worry they wouldn’t be able to contract advantageous marriage for their own daughters, and blamed the Queen for it. Savoyards also enjoyed royal patronage and, a few of them also received lands and huge amounts of money, which enraged the English magnates even more. Despite being politically clever and astute, Eleanor was never able to ralate to the English magnates and their problems. She also didn’t seem to be bothered about her unpopularity. It has been suggested that the reason for this was because the Savoyards served as a counter-faction to the Lusignans, Henry’s stepsiblings (Henry’s mother Isabelle had had five children from her second husband Hugh de Lusignan), with whom Eleanor had never got on well. In 1258, the English magnates were fed up with this situation. Parliament, which was held at Oxford, called for a new form of government, “consisting of three annual Parliaments, an elected council of fifteen seved by twelve representatives from the baronage”*, and all castles to be held by Englishmen. They also wanted to institute a committee of five to decide “the sale of wardships in the King’s gift”* and “in which areas the tariff of queens-gold should apply”*. Eleanor was affronted by this attack on her prerogatives, and, although both she and the King swore an oath of allegiance to them, in reality they had no intention of respecting it. Again it was Eleanor that was entirely blamed for the King’s repudiations of these reforms. And by the next summer, the south-east of England was rebelling against their King. The Queen now couldn’t ignore the hatred the people felt against her anymore. When she tried to travel from the Tower, where she had taken refuge, to Windsor where her son Edward was, she was mobbed on London Bridge by a vicious crowd who insulted and threw rubbish at her. She was forced to go back to the Tower, but her husband wouldn’t let her in. In the end, she took refuge in the home of the Bishop of London. The royal couple would meet again three days later and, in the meantime, Henry had agreed to the barons’ terms. Eleanor then tried to raise an army to reinstate the prerogative of the crown with force but nothing came of it. In 1272 King Henry III died and was succeeded by his son Edward. Eleanor was now isolated. Most of her Savoyard relatives were dead and her children were abroad. She spent the rest of her life raising her grandchildren and in the end retired to the convent of Amesbury, where she died on 24 June 1291.